Radical Polymers recently released a comprehensive data package comparing INITIA 205 to a leading competitor. The data targeted calcium phosphate stabilization under a variety of pH, temperature, hardness and phosphate levels. In 7 of 9 evaluations, INITIA 205 beat the competitive polymer in head to head comparisons. INITIA 205 tied the competitive polymer in the other two, low stress, evaluations. 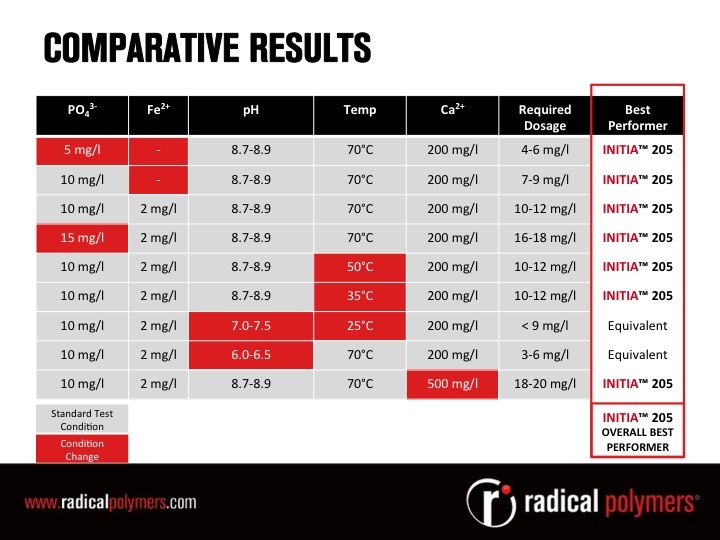 Contact Radical Polymers at info@radicalpolymers.com for a copy of the full data package.